The Hoyo de Monterrey Epicure No.1 is a rich and creamy Habano, of Corona Gorda size, 5.6”(143mm) long, of 46 ring gauge, and comes in a 15 cigars box. 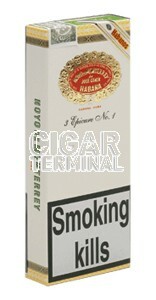 It is a cigar of the next to perfect construction; the wrapper is smooth and slightly oily. It is smoking beautifully and the draw on this cigar is flawless. On top of that, the flavor profile of this stogie is incredible. Definitely a must-try for all the fans of Corona Gorda vitolas. There are flavors of wood, earth, hay and nuts. There is also lots of creamy espresso, and some mineral notes. It might not be the most complex cigar, but it nevertheless won’t let you indifferent. Some delicate touches of pepper also spice up the Epicure No.1, whereas in terms of strength, it never goes over a medium body. Very similar to a Partagas or a Romeo y Julieta in term of appearance and flavor profile. It also has a great potential for ageing.